Samsung's latest 5" media player is about to hit store shelves in Europe, but it's only just begun to ship here in the US. I've been watching the Galaxy Player since it was unveiled back in February (video), I have to say that the specs do not disappoint. The Galaxy Player is based on a 5" (800x480) capacitive touchscreen, and it's running the latest version of Android Gingerbread on a 1GHz CPU. It has Wifi, Bluetooth, GPS a pair of cameras, speaker & mike, microSD card slot, and 8GB Flash storage. Samsung are boasting that the Galaxy Player has impressive video and audio support, as well as access to the Android Market. It also ships with a full suite of Google Apps, Youtube, and there's special emphasis on Skype being available through the Android Market. The estimated battery life for this 6 oz. wonder is 60 hours of music or 8 hours of video. You can find it for $270 on JR.com. Samsung is hoping that you'll decide to replace your phone with theGalaxy Player ; that's why it has the speaker, mike, and Skype. It seems to me that they took a phone and simply swapped out the 3G chip. I was a little surprised to see the price; that's a little rich for my tastes. It's also a lot higher than most Android budget tablets. Sure, the Galaxy Player will likely have a better build quality, but there's something to be said for a larger screen size. Also, the Galaxy Player is clearly designed to compete with the iPod Touch, right? Well, the iTouch starts for a lot less than the Galaxy Player. I don't see that this baby has a market. Size (WxHxD): 3.08 x 5.56 x 0.47 in. I wish the touch had a 5″ screen sometimes. Still, I love mine and wouldn’t trade it for this Galaxy player. I’m the market. The iPod Touch has a crapcam that makes it absolutely useless as a mobile blogging tool. Plus, there’s Graffiti for Android, which might finally free me from my LifeDrive. Also, this has a microSD slot, so you can go up to 32GBs. A 32GB iPod Touch is $299.00. And you STILL have a worthless crapcam! I should have added: I was at J&R today. It wasn’t out for fondling, so it’s still at their warehouse for web-only buying. Give it another week or two for a fondle. This article did not mention the 4-inch Samsung Galaxy Player 4.0 ($229 at J&R, Amazon, etc. ), which is the actual direct iPod Touch competitor. The Galaxy Player 4.0 and 5.0 set a new standard that the current and new iPod Touch 4th Gen frankly do not meet. 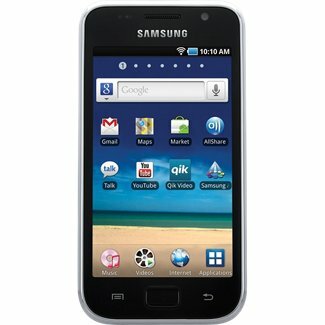 The Samsung Galaxy Player 4.0 (priced at $229.99 to compete with the iPod Touch’s original price) and 5.0 (priced at $269.99) each have 8GB of internal memory like the stock iPod Touch. Both have front and back cameras (the 5.0 also has an LED flash for the camera). The iPod Touch’s screen has higher resolution, but is smaller than the 4″ and 5″ Galaxy Players, so that is a tradeoff. Bottom line, Apple blinked with the new iPod Touch. The Samsung Galaxy Player 4.0 and 5.0 outmatch the iPod Touch 4th Gen’s hardware-based features in every respect except for the screen resolution. The iPod Touch 4th Gen’s 3.5in diag 960×640 “Retina” LCD resolution is better than Samsung Galaxy Player 4.0’s 4in diag 800×480 “Super-TFT” LCD and 5.0’s 5in diag 800×480 TFT LCD displays. However, that win doesn’t make up for the iPod Touch’s now inferior specs when compared with those of the the Samsung Galaxy Players. If the author doesn’t “see that this baby has a market”, then he must have a similar opinion about Apple’s now obsolete iPod Touch. Where is the market for this? Those that don’t want to have a cell phone? i guess if you have an older phone and want to carry 2 devices around………..
>>>Where is the market for this? Those that don’t want to have a cell phone? The same could be said for the iPod Touch. This is for people who think the iPod Touch is crap. Maybe not everybody (like Eddie below) want a dataplan they won’t use and thus an expensive smartphone (ever seen the “base” price of smartphones if you don’t want a dataplan?). When I wanted a new MP3 player, I was looking at the Touch but I simply refuse to buy something from a company that censors and I want absolutely nothing to do with itunes. So, the Touch was out. If this one was available at that time, I would probably have given it a second, third and maybe even fourth look. Do you question “Where is the market?” for the iPod Touch? If yes, then at least you are consistent. If no, then please explain why the Samsung Galaxy Player receives your scorn while the iPod Touch does not, especially given the Galaxy Players’ superior feature set. Nope, I didn’t question the iPod Touch. 3, the iTouch was released at a time when people were already buying the iPhone just to use it as a media player. The same cannot be said for the Galaxy Player. I, for one, can’t wait to get one of these. I’m 38 years old and this will be my first mp3 player. I would have bought an iTouch long ago if they came with GPS. I was hoping apple would include GPS in the new touch but no such luck. Since Apple won’t do it, I’ll try this one out. Sure, a smartphone would be nice, but he $30/month data plan is a deal breaker for me. I hope there are enough cheapskates like myself to make the galaxy player profitable for Samsung. Yes, the 30$/month or more data plan on top of my 25-35$ home internet connection is too crazy for me. I live urban; there is free wifi everywhere. A friend from out of town asked me the other day where on Brady Street (Milwaukee) could she find wifi. Pretty much anyplace you can sit down has free wifi I told her. If its anything like my Samsung Fascinate’s GPS.. run, run far away, sometimes my GPS doesn’t kick in until I’ve already arrived. I would have no problem with them, but they don’t perfect the stuff they already have, they just keep flooding the market with more. Seriously though, Apple isn’t going to put a GPS in iPod Touch unless they can put in 3g/4g and I doubt the cell companies will ever allow that. That would be the perfect reason for people to drop their smartphones with voice minutes and just get an iPod Touch or a Galaxy Player and use skype.. I for one would drop mine in a heart beat. I’m actually already considering it, just with a tablet. How will the apps perform on this galaxy player when I’m out of wifi range? Can I take it to the beach and use the constellation app? Will I be able to cache old emails and refer to them? Do most games work without a data signal? I’ve seen some offline map apps, so I think I can still use the GPS for what I want. I don’t care about turn-by-turn directions. What functionality will I lose when I take the Galaxy Player camping with me? Emails are cached on my phone to be reviewed whenever I’m not near wifi, using the built in Gmail app I can view pre-cached emails with no problem. As for games working without a data signal, some games and apps have server authentication to determine if the app is legitimate or not (Sims 3 comes to mind). Most other apps and games work just fine away from a data source. And for camping, you’ll only lose data-centric functionality. You’ll still have an FM radio, the ability to read downloaded ebooks, play mp3s, most games, edit documents (if you like doing that sort of thing on a small device), use it as an alarm clock, etc. It’s a smartphone, minus the cell radio. I’m currently using an LG Optimus V without a plan whatsoever exclusively on wifi, thanks to GrooveIP (wifi Google Voice calling), Google Voice (for texting), and a large number of free wifi hotspots to cut my cell bill down to $0 a month. The Samsung Galaxy Player 4 will be a replacement for my Optimus V when I can finally get my hands on one, hopefully I can get some Cyanogenmod love for it too. Not to mention the SGP4 will have killer battery life, a larger screen, and beefier all around specs compared to my Optimus V all for around $30 more than I paid for my phone off contract. You’ll like it. If you have a Best Buy or the like in your area, stop in an play with a Samsung Galaxy S and play with it in airplane mode. This will give you a good feel for how this player will work without a data connection. Hey, THis device looks nice. It doesn’t have GPS, but for 79 bucks maybe it’s worth trying out. I’d feel pretty lame if I spent 270 on a gadget that I ended up not using..